I had a chance to try out Elizabeth Restaurant in Lincoln Square Wednesday night, which has received a lot of great reviews on Yelp. My company included the famous blogger and apparent local legend behind Chow-Eng Down, who was recognized by both the sommelier and chef based on his attendance at some of the other places that they previously had worked at. 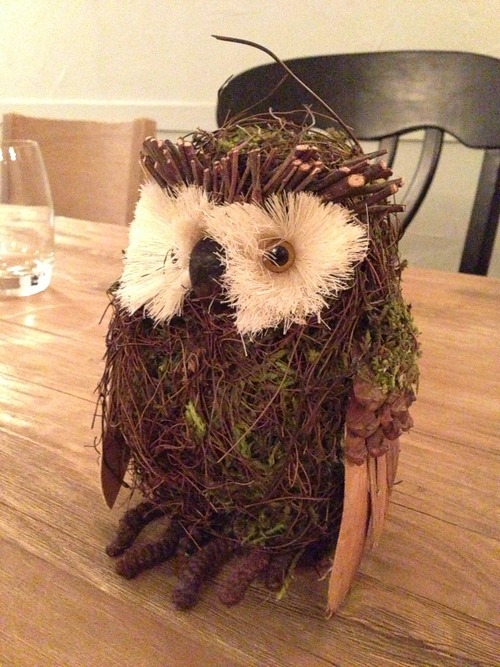 Elizabeth Restaurant offers 3 different tasting menus; we enjoyed the Owl menu, and our centerpiece reminded us of that. Due to the informal nature of this meal, I don’t have nearly as much information to share about the dishes as my Girl & the Goat post, as I frankly just don’t remember much between the talking and wine. However, dark, grainy pictures should suffice. Additionally, there were a lot of ingredients mentioned, and I couldn’t jot down all of them, so you can try to piece things together. This first course of the night, and it came out with a bang. 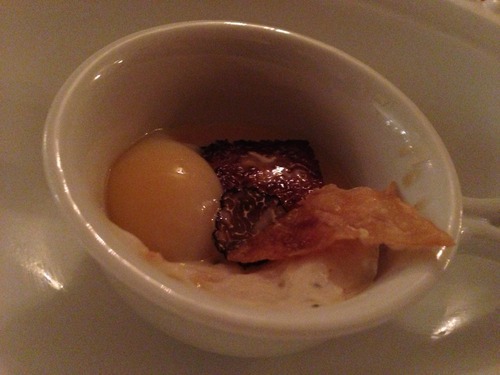 At the bottom of the liquid there was some caviar (as you might expect) and a piece reminiscent of pie. 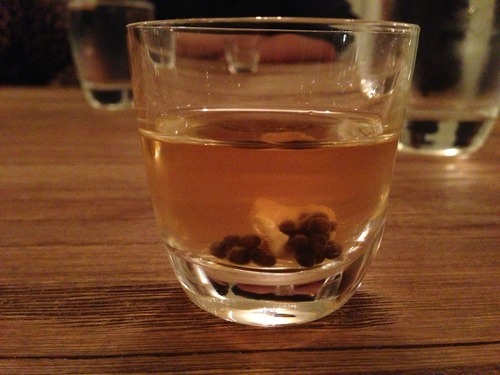 This concoction actually tasted exactly like apple pie, and left me with a lasting taste of it in my mouth. In other words, it was phenomenal. 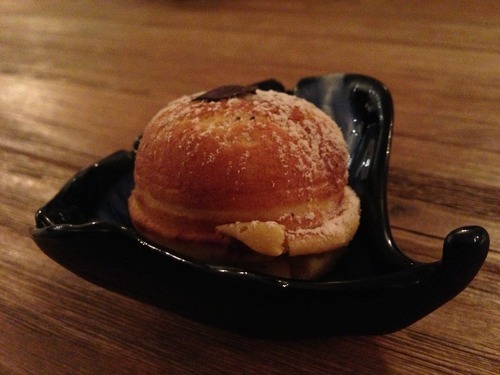 It also set the tone for the first half of the courses, where a touch of sweetness was included in the dishes. 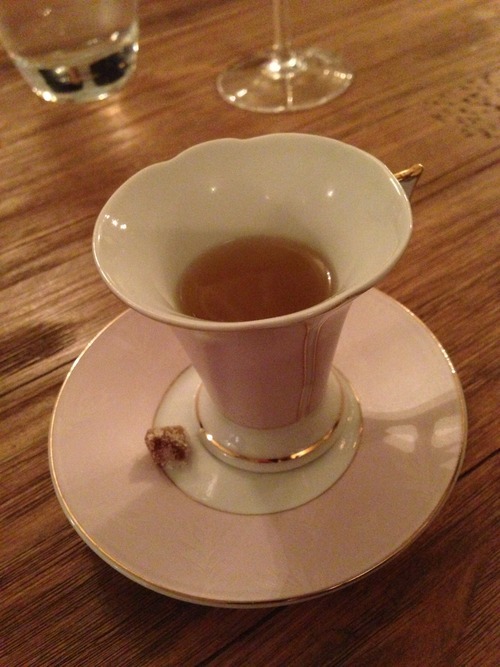 The spiced carrot tea, particularly after taking the candied ginger, was absolutely delicious. One of the other diners compared it to Bengal Spice tea, but it had a sweetness to it that made me want to savor every last drop of it. 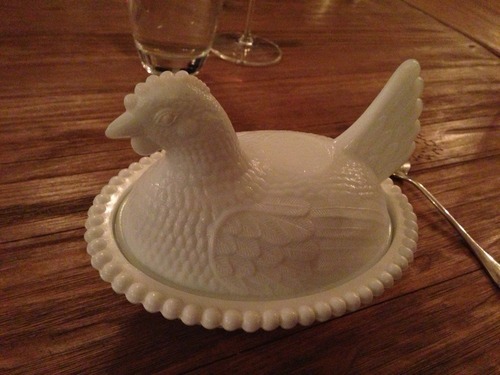 Dare I say, favorite dish of the night? There were quite a few ingredients on this plate, but I can only recall salmon, pumpkin, apple, kohlrabi, and some sort of jelly (there were probably 5 more…). Though it might be hard to see, there was quite a bit of salmon on this dish (3 or 4 rolls). It was matched by the 3-4 rolls of thinly sliced apple, which I found somewhat overwhelmed the other ingredients on the plate. 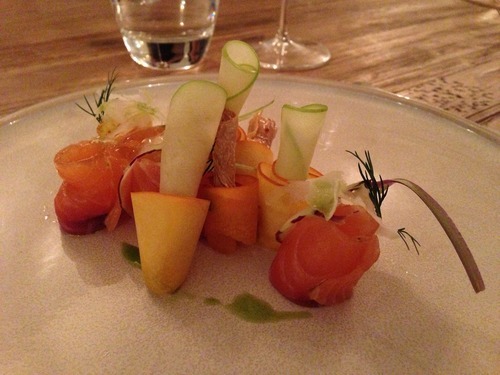 I’m not usually a big raw salmon fan, but overall the accompaniments went well with it. I honestly can’t remember much about this dish, except that the creamy soup had a nice sweetness to it. 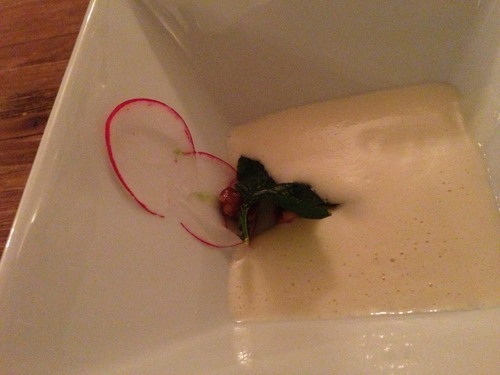 It was accompanied by candied walnut and radish. I do remember enjoying it though. This course consisted of a cornbread pancake filled with trout roe from Michigan. Again, I can’t recall details on this one, but I do remember an explosion as I bit into it. And that I took 3 bites to savor it. 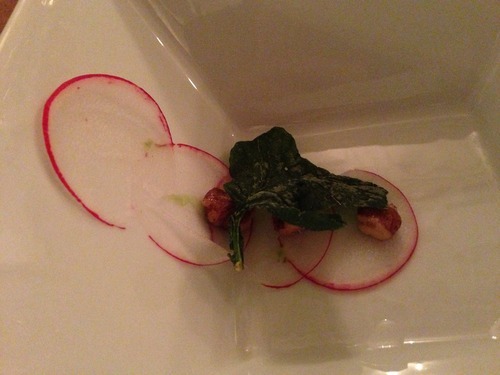 This dish brought more varieties of cauliflower than I knew existed, along with veal sweetbreads. 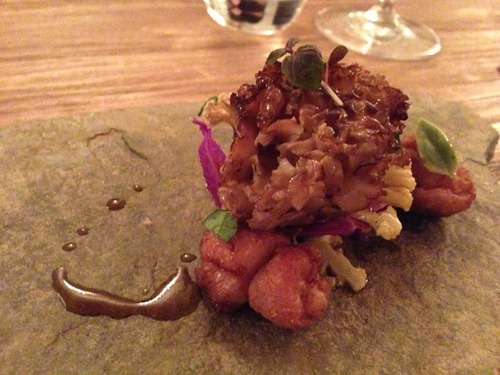 The sweetbreads were tasty, and there were 3 servings that were easily cut in half to get 6 bites out of with some of the different types of cauliflower. I’m not the biggest cauliflower fan in the world, but it was an interesting experience. This course was served with a wine that the sommolier referred to tasting like “fried chicken skin.” Needless to say, it was good. 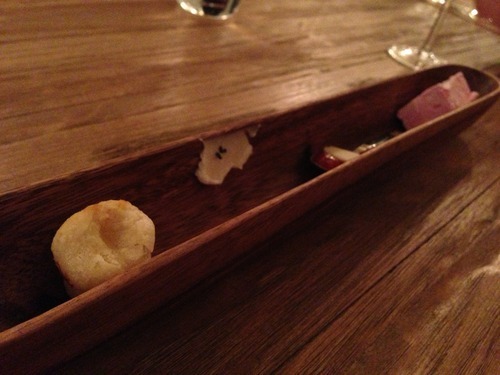 I don’t really remember the exact ingredients of this course, but I remember devouring it. Quickly. The second part of the previous course. 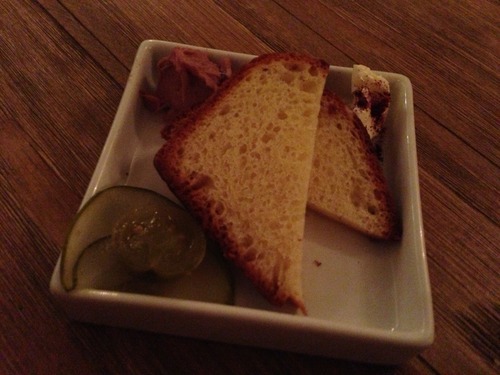 Included homemade brioche, duck liver, pickled cucumber, green tomato (I believe), and a 5th item that I cannot recall. What I recall being a green tomato was especially good. Up until this point, most of the courses we had were more similar to bites rather than a plate. 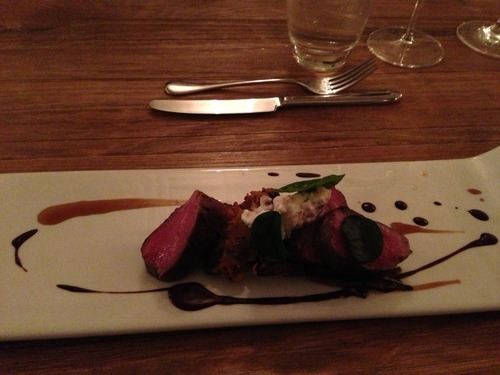 That changed with the lamb, as it was a rather generous portion that helped fill me up. Included in this preparation, but not limited to, included lamb saddle, cream cheese ragù, lamb reduction, and about 7 other things I couldn’t type fast enough. 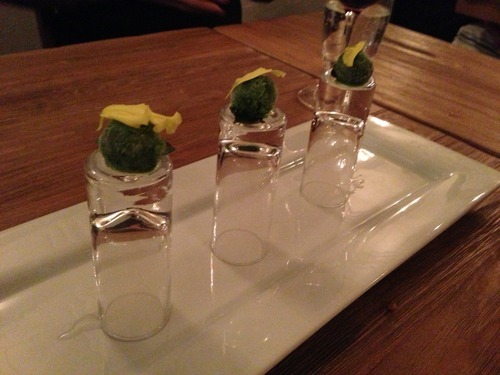 An interesting presentation of swiss chard as sorbet. Once again, things were getting hazy by this part of the meal. I do recall it being tasty though, and it had an detectable smokiness to it (as you may have guessed from the title). 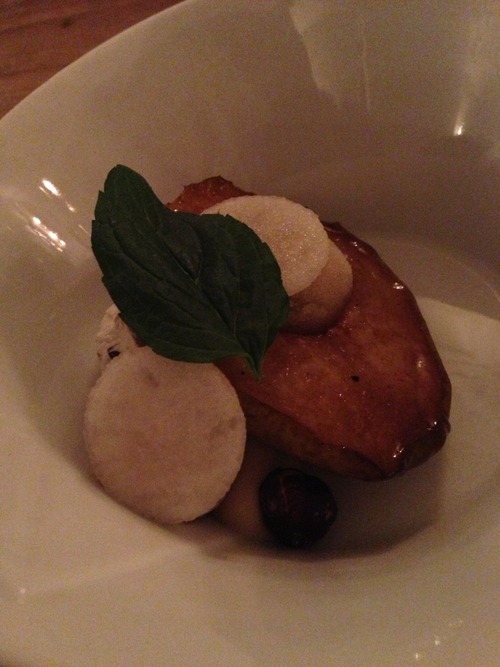 The caramelized pear was quite good, although by this point I was starting to feel a bit stuffed so it was a bit large on the serving size. My notes also tell me there was pear butter and powder hazelnut, among other things I heard but didn’t write down. 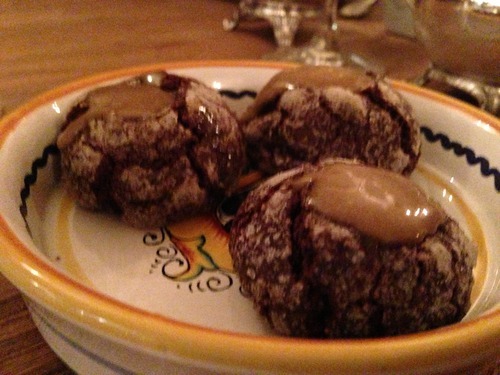 More specifically, these were chocolate almond cookies with an earl gray tea topping. These were hot out of the oven, soft on the inside, and extremely delicious. Would go great a la mode (reminded me of a molten lava cake). The service was great. The ambiance was very rustic and informal; there are 3 tables that seat about 8 people each (a table per menu I presume). It felt like someone’s mom invited us over for a fancy dinner based on the close interactions we had with the team over the course of the night. The meal itself was excellent and very reasonably priced (ours was $65 before tax/tip/drinks) compared to some of the other tasting menus in the city, making it an excellent value and a must-try. The wine pairings were spot on, and as per usual more wine that I probably needed (but I couldn’t let any of it go to waste). If I recall, we had 3 whites, 2 reds, and a dessert wine. I’d highly recommend anyone interested in Chicago cuisine to try out Elizabeth. The Owl menu was sufficient for me, as I was pretty stuffed near the end, but what is nice is that the three menus they offer allegedly don’t overlap (so they end up cooking over different 40 dishes every night).